This First Look introduces you to InterSystems Cloud Manager (ICM), the end-to-end cloud provisioning and deployment solution for applications based on InterSystems IRIS™. As part of this guide you will use ICM to provision infrastructure in a public cloud and deploy InterSystems IRIS on that infrastructure. To browse all of the First Looks, including those that can be performed on a free cloud instance or web instance, see InterSystems First Looks. What Can ICM Do for You? Are you eager to take advantage of the cloud, but hesitant to commit resources to a complex migration? Are you already in the cloud, but struggling to find a way to manageably deploy and version your application across a wide range of software environments? Do you want to bring continuous integration and delivery to your software factory and a DevOps approach to your deployment process? That is, would you like to free yourself from the limitations and risks of legacy practices, library dependencies, system drift, manual upgrade, and other overhead? ICM can help! ICM gives you a simple, intuitive way to provision cloud infrastructure and deploy services on it, helping you get into the cloud now without major development or retooling. The benefits of infrastructure as code (IaC) and containerized deployment make it easy to deploy InterSystems IRIS-based applications on public cloud platforms such as Google, Amazon, and Azure, or on your private VMware vSphere cloud. Define what you want, issue a few commands, and ICM does the rest. Even if you are already using cloud infrastructure, containers, or both, ICM dramatically reduces the time and effort required to provision and deploy your application by automating numerous otherwise manual steps. Guided by your input in plain-text configuration files, ICM provisions your infrastructure using the popular Terraform IaC tool from Hashicorp and configures the provisioned compute nodes as needed. In the next phase, ICM deploys InterSystems IRIS and your application in Docker containers, as well as other services if desired. All of the InterSystems IRIS configuration needed for the deployment you want is carried out automatically. ICM can also deploy containerized services on existing virtual and physical clusters. Sample configuration files you can use as templates to quickly define the deployment you want. InterSystems IRIS Docker images to which you can add your application. User-friendly commands for each task. Multiple ways to manage and interact with the provisioned nodes and the services deployed on them. ICM carries out many tasks for you and gives you numerous options to help you deploy exactly what you need, so its use in production involves a certain amount of planning and preparation (although much less than manual methods!). But the provisioning and deployment process is simple, and ICM can make many decisions for you. This exploration is designed to let you see for yourself how ICM works, and how easy it is to deploy an InterSystems IRIS configuration on Amazon Web Services (AWS) using ICM. While it is not the work of a moment, this exploration should not take up too much of your time, and you can do it in stages as opportunity arises. To give you a taste of ICM without bogging you down in details, we’ve kept this simple; for example, we’ve had you use as many default settings as possible. When you bring ICM to your production systems, though, there are many things you will need to do differently, especially in regard to (but not limited to) security. So be sure not to confuse this exploration of ICM with the real thing! The sources provided at the end of this document will give you a good idea of what’s involved in using ICM in production. The ICM Guide provides complete information and procedures for using ICM. If you prefer, you can deploy InterSystems IRIS on Google Cloud Platform (GCP) or Microsoft Azure instead of AWS; links to the needed information in the ICM Guide are provided where appropriate. These instructions assume you have an InterSystems IRIS license and access to InterSystems software downloads. ICM is provided as a Docker image that includes everything you need. Therefore the only requirements for the Linux, macOS, or Microsoft Windows system on which you launch ICM are that Docker is installed, with the Docker daemon running, and that the system is connected to the Internet. To download and run the ICM image, and to deploy the InterSystems IRIS image in the cloud using ICM, you need to identify the repository in which these images are located and the credentials you need to log into that repository. The repository must be accessible from the internet (that is, not behind a firewall) in order for the cloud provider to download the InterSystems IRIS image. If your organization does not have an internet accessible Docker repository, you can use the free (or extremely low cost) Docker Hub for your testing. ICM can provision and deploy on three public cloud platforms: Amazon Web Services (AWS), Google Cloud Platform (GCP), and Microsoft Azure. Here we will use AWS. You can create a free trial account at aws.amazon.com/free. aws_secret_access_key = <value in "Secret access key" column"
It is this new file that you will identify to ICM as your AWS credentials file. For information about how to download and use credentials for a GCP or Azure account, see Provider-Specific Parameters in the ICM Guide. 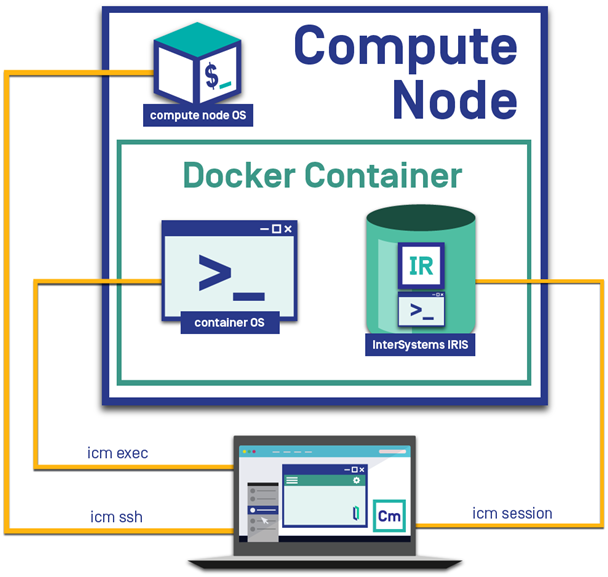 ICM communicates securely with the cloud provider on which it provisions the infrastructure, with Docker on the provisioned nodes, and with several InterSystems IRIS services following container deployment. You have already downloaded or identified your cloud credentials; you also need other files to enable secure SSH and SSL/TLS communication. You can create the files you need using two scripts provided with ICM, The keygenSSH.sh script creates the needed SSH files and places them in the directory /Samples/ssh in the ICM container. The keygenTLS.sh script creates the needed SSL/TLS files and places them in /Samples/tls. Generating keys for SSH authentication. Generating keys for TLS authentication. For more information about the files generated by these scripts, see Obtain Security-Related Files, ICM Security, and Security-Related Parameters in the ICM Guide. These generated keys are intended as a convenience for your use in this First Look experience and other tests; in production, you should generate or obtain the needed keys in keeping with your company's security policies. The keys generated by these scripts, as well as your cloud provider credentials, must be fully secured, as they provide full access to any ICM deployments in which they are used. To define the configuration you want ICM to deploy, you include the needed settings in two JSON-formatted configuration files: the defaults file and the definitions file. The former (defaults.json) contains settings that apply to the entire deployment  for example, your choice of cloud provider  while the latter (definitions.json) defines which types of nodes you want and how many of each, thereby determining whether you deploy a sharded cluster, a single stand-alone IRIS instance, or some other configuration. The following tables indicate the minimum customization needed for /Samples/AWS/defaults.json file, plus suggestions for optional changes. (The settings in the table are ordered differently than in the sample defaults.json file.) The first setting in the file is Provider: AWS; do not change this. See Amazon Web Services (AWS) Parameters in the ICM Guide and the AWS documentation for more information about these settings. Location of downloaded AWS credentials file. Use docker cp to copy your AWS credentials file (see Get an AWS Account and Credentials) to this location. Geographical location and zone of compute resources used to provision infrastructure. OPTIONAL: Change to your preferred region and zone. Amazon Machine Image (AMI) and instance type used to provision compute nodes. ICM currently supports provisioning of and deployment of containers on compute nodes running Red Hat Enterprise Linux, version 7.2 or later and Ubuntu version 18.04 or later. OPTIONAL: Change to your preferred AMI and instance type. Some instance types may not be compatible with some AMIs. The settings provided in the sample defaults.json are compatible. Nonroot account with sudo access on provisioned nodes, used by ICM for access; determined by selected AMI. Do not change if using Red Hat Enterprise Linux image. Arbitrary fields in naming scheme for provisioned cloud nodes: Label-Role-Tag-NNNN, for example Acme-DM-TEST-0001 or Acme-DS-TEST-0005. Update with custom information indicating ownership and purpose, to avoid conflicting with others testing ICM. Multiple deployments should not share the same Label and Tag. Security keys for SSH and SSL/TLS (see ICM Security and Security-Related Parameters in the ICM Guide). If you used the key generation scripts discussed in Generate Security Keys, the keys are located in these directories; make no changes. If you provided your own keys, use docker cp to copy them from the local file system to these locations. LicenseDir: /Samples/Licenses Staging directory for InterSystems IRIS license keys. Place your InterSystems IRIS license key in this directory. The Docker image to be deployed on all provisioned nodes, and the credentials needed to download that image if in a private repository; see Identify Docker Repository and Credentials for important information. Change these values to reflect the repository information and credentials you identified in Identify Docker Repository and Credentials. Password for predefined accounts in deployed InterSystems IRIS images. To provide the password interactively with masked input during the deployment phase, remove this field. Otherwise, change to your preferred password. Settings specific to GCP and Azure differ from those for AWS. For information about the settings you will need to modify in the defaults.json files in the /Samples/GCP and /Samples/Azure directories, see Provider-Specific Parameters in the ICM Guide. Additional choices for AWS RHEL 7.2 or later AMIs are listed in the following table; this information is subject to change at any time. More images can be found in the Amazon marketplace. The /Samples/AWS/definitions.json file (which is the same for all providers) defines a basic sharded cluster with a shard master data server and two shard data servers, as follows. The Role field identifies the node type being provisioned, which in this case is DM for the shard master data server and DS for the shard data servers. The Count field indicates how many of that type to provision; StartCount starts numbering at 0002 for the DS nodes. All DM, DS, AM, and QS nodes deployed by ICM require an InterSystems IRIS license; when a sharded cluster is deployed, all nodes must have a sharding license. (When DM and AM nodes are deployed in another configuration, a standard license is sufficient.). Use docker cp to copy a sharding license to the specified location within the container, such as /Samples/Licenses, and update the LicenseKey setting in each node definition to specify license key to use. The icm provision command allocates and configures compute nodes on the platform you have selected. During the provisioning operation, ICM creates or updates state and log files in the state subdirectory and when finished creates the instances.json file, which serves as input to subsequent deployment and management commands. Copy the icm unprovision command provided in the output and save this information, so you can easily replicate it when unprovisioning. This output also appears in the icm.log file. Detailed information about errors that occur during the provisioning and deployment phase is written to terraform.err files in subdirectories of the state directory; when an error occurs, ICM directs you to the appropriate file, which can help you identify the cause of the problem. If icm provision does not complete successfully due to timeouts and internal errors on the provider side, you can issue the command again, as many times as needed, until ICM completes all the required tasks for all the specified nodes without error. When doing so you must use the -stateDir option to specify the state directory (such as /Samples/AWS/ICM-8620265620732464265) created the first time, to indicate that provisioning is already in process and provide the needed information about what has been done and what hasn’t. However, if you determine that the problem was caused by an error in a configuration file, unprovision the infrastructure, fix the error, and run icm provision again. For more information about icm provision, see The icm provision Command in the ICM Guide. 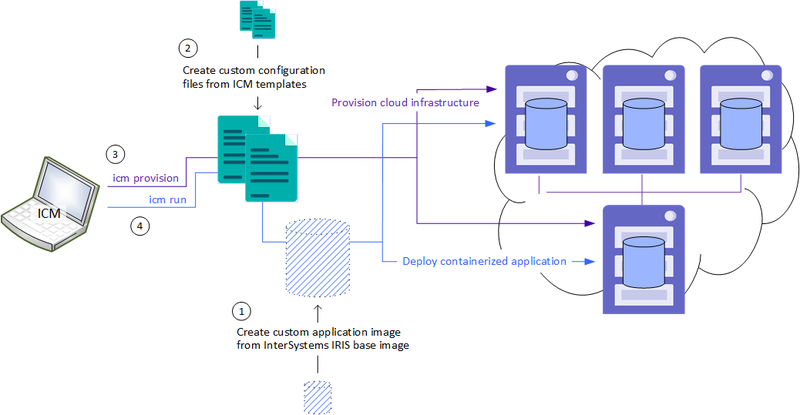 By default, icm run downloads and runs the image specified by the DockerImage field in the configuration files, in this case the InterSystems IRIS image from the InterSystems repository; each container is named iris. In practice, using different DockerImage fields in the node definitions in the definitions file (instead of once for all nodes in the defaults file, as here) lets you run different images on different node types, and beyond that you can execute the icm run command multiple times with certain options to deploy multiple containers with unique names on each provisioned node or only on specified nodes. After InterSystems IRIS starts on each node, ICM does whatever configuration of the instance is needed  for example, resetting the password, creating the namespace you specified, configuring sharding, and so on. Because ICM runs multiple tasks at once, the steps in the deployment process may not start and complete on the nodes in the same sequence. At completion, ICM outputs a link to the Management Portal of the appropriate InterSystems IRIS instance; in this case, the provided link is for the shard master data server (DM) node, or for the stand-alone instance if that is the configuration you chose. Open the link in your browser and explore InterSystems IRIS using the Management Portal. In the event of an error, see the log file ICM directs you to for information that can help you identify the cause of the problem. Unlike the icm provision command, the icm run command cannot simply be repeated if it fails on one or more nodes. Generally speaking, there are two causes for deployment failures. External factors such as network latency and disconnects or interruptions in cloud provider service. Enter icm stop on the ICM command line to stop any InterSystems IRIS containers that were successfully deployed. Enter icm rm to remove those containers. icm ssh -command "sudo rm -rf /intersys/*/*"
One or more errors in the configuration files. When deployment fails due to configuration file error  for example, if you made a mistake typing the value for the DockerImage field  the needed correction to the configuration file may render the instances.json file created during provisioning inaccurate and thus invalid. To avoid further errors, after correcting the mistake you should unprovision the infrastructure and start again with the icm provision command, as described in the previous section. For more information about the icm run command and its options, see The icm run Command in the ICM Guide. Interacting with services running in deployed containers, including InterSystems IRIS. Try these commands on your newly deployed InterSystems IRIS configuration! icm ssh -command "df -k"
When a command is executed on more than one node, the output is written to files and a list of output files provided. For example, in this case, if you deployed the sharded cluster, there is one output file for each of the three nodes. When multiple containers are deployed on the nodes, this command lists them all. icm exec -command "ls /intersys/"
The -namespace option determines the namespace in which the SQL executes. Because AWS and other public cloud platform instances continually generate charges, it is important that you unprovision your infrastructure immediately after completing this experience. This command deallocates the provisioned infrastructure based on the state files created during provisioning, so the -stateDir option is required; you cannot simply enter icm unprovision. If you did not save the command from the provisioning output, you can find it in the icm.log file in your working directory (for example, /Samples/AWS/icm.log). The -cleanUp option deletes the state directory after unprovisioning; without it, the state directory is preserved. ICM Can Do Much More Than That! Add shard master application servers and shard query servers to the sharded cluster by adding AM nodes and QS nodes to the definitions.json file. Deploy a distributed cache cluster of application servers and a data server by defining AM nodes and a DM node but omitting a DS node definition. Deploy a mirrored DM node in any of its possible roles  the shard master data server of a sharded cluster, the data server of distributed cache cluster, or a stand-alone InterSystems IRIS instance  by simply including Mirror: True in the defaults file and defining two DM nodes and an AR (arbiter) node in the definitions file. Add web servers (WS) and load balancers (LB or automatic) to the definitions file. Add Weave Scope monitoring to your provisioned nodes by including the Monitor field in the defaults file. Deploy different services on different nodes by specifying different DockerImage values for different nodes in the definitions file and issuing the icm run command multiple times. Deploy multiple services on some or all nodes by executing icm run multiple times while specifying different container names and images, including custom and third-party images, on the command line with the -container and -image options. Extend ICM’s functionality through the use of third-party tools and in-house scripting, further increasing automation and reducing effort. Deploy services on existing virtual and physical clusters. Provision infrastructure without deploying services, simply by stopping with the ICM provision command. All of these possibilities and more are covered in the ICM Guide.